Yoshino Mountain was the subject of a waka poem in the 10th century poetry compilation Kokin Wakashu. It is also the subject of several poems in the Hyakunin Isshu. Several important religious and pilgrimage destinations are located around Mount Yoshino, including Yoshino Mikumari Shrine, Kimpu Shrine, and Kimpusen-ji. 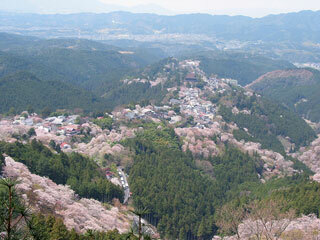 It is well known for its cherry blossoms, and attracts many visitors every autumn. This article uses material from UNESCO World Heritage List article "Yoshino Mountain", which is released under the Creative Commons Attribution-Share-Alike 3.0 IGO License.